Between building a new phone app, playing with a new Surface, and attending exciting development community events, I almost completely forgot to write about this year’s Indy GiveCamp. A few weeks have passed since the event and my memory is a bit fuzzy so this will be a little sparse but I better capture what I can remember. Indy GiveCamp was held October 5-7. Once again MID Technologies was kind enough to allow our group of more than 40 software professionals to use their facility for the weekend so we could help five organizations achieve their goals through better use of technology. As a bonus, we had enough unregistered volunteers to offset the number of no-show volunteers so we were able to assign a few people to work on the Indy GiveCamp site too. 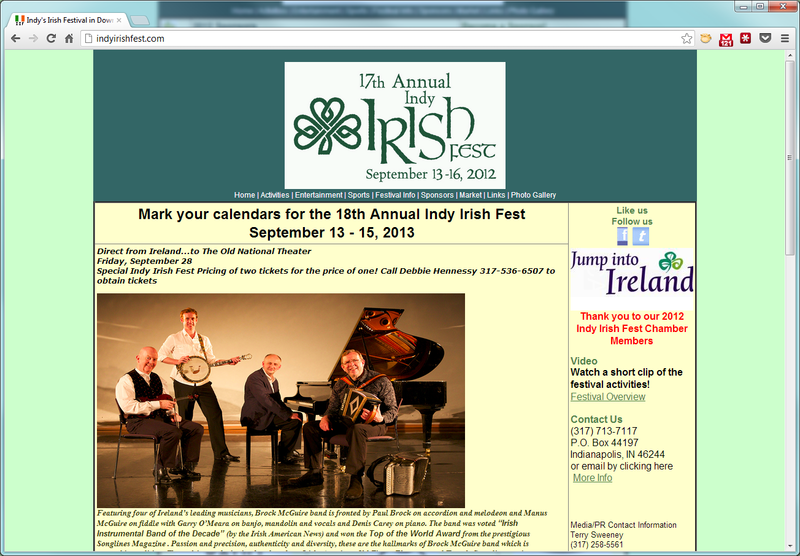 I was the lead for the Indy Irish Fest project. Indy Irish Fest is an all-volunteer organization whose mission is to preserve, promote, and nurture Irish culture, arts, music and history. 2012 marked their 17th annual festival. The organization has been living for years with a site that was becoming dated and increasingly difficult to maintain. It was cluttered and information was often hard to locate. Additionally, the site was static HTML built and modified with FrontPage. To make matters worse, sometime shortly before GiveCamp the FrontPage visual editor started choking on some HTML and forcing them to make changes to the HTML directly. 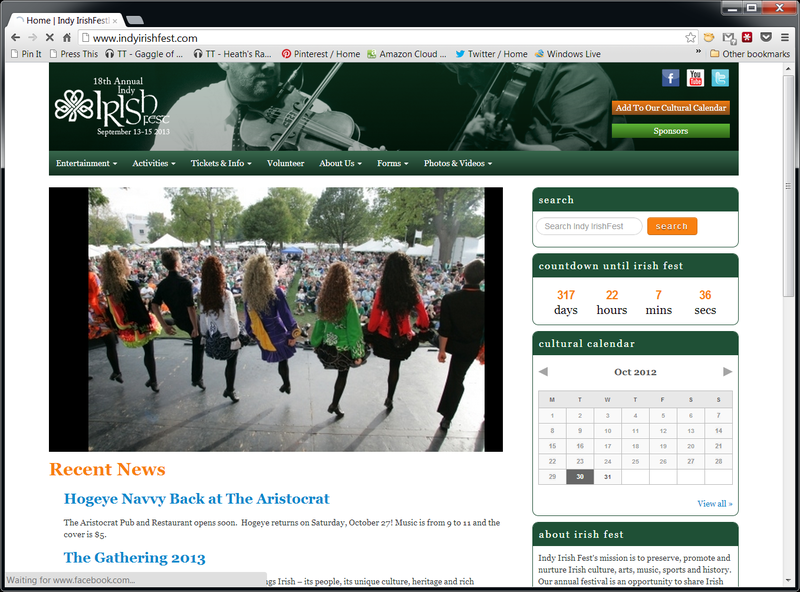 After a lot of discussion with Mary and Terry from Irish Fest about their goals for the site and with the help of the two volunteer designers we were able to modernize their site and transform it into one that they could use to better spread their message without the friction of FrontPage. We reorganized most of the content, promoting the most important things, and demoting some of the less important things. We made it easy for visitors to locate cultural events in the cultural calendar, to sign up for the mailing list, and find content through a search. We also made it easy for visitors to connect with the festival through various social media outlets with focus on Facebook and Twitter. GiveCamp is one of the few outlets for software professionals to use their talents to give something back to their local community. I was excited to work with such talented people on the Irish Fest site and once again proud to be part of a larger effort where five organizations were given the help they needed to enter their next chapter. I’m already planning on volunteering next year. If you can spare a weekend I really recommend joining in on the action. You won’t be disappointed. Posted in Community, GiveCamp, Software Development and tagged GiveCamp, Indy GiveCamp on October 30, 2012 by Dave Fancher.